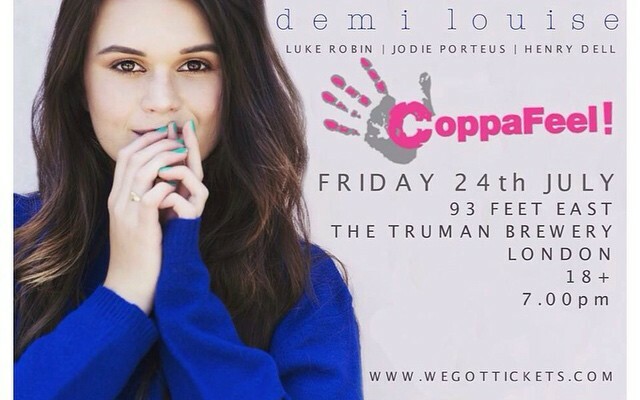 ‘Demi Louise’ visits London for a very special show. This will be her ONLY London show this year, definitely not to be missed. Be sure to keep FRIDAY 24th JULY free and head to : 93 FEET EAST, BRICK LANE, LONDON for a night to remember and at the same time you’ll be supporting boobies (or puppies as she calls them). All Links below, for tickets and more. This Friday July 24, Demi Louise (22 Award winning singer/songwriter from Melbourne) Henry Dell (23 singer/songwriter from Brighton) and Luke Robin (20 singer/songwriter from Bolton) will be performing alongside each other for a special one night only show, supporting breast cancer awareness. Not only will you experience great music, at the same time you’ll be supporting a great cause. ‘Coppafeel’ are an educational breast cancer charity, which teaches young people the signs and symptoms of breast cancer to help stamp out late detection and save lives! Raising money for Urika’s (the organiser’s) trek along the Great Wall of China this October, with a hefty target of £3250, all donations and ticket sales will be donated to this very worthy cause. So far Demi Louise has has a great music career (understatement of the year) with so many stories to tell that only few could dream of. Check her YouTube, she regularly vlogs about many of her experiences including how she loves snow, doughnuts, squirrels and of course music. Demi only 22 years young from Melbourne Australia has traveled the world, promoting her music; making videos and lots of people smile including us. She walked away from the XFactor dream to achieve her heart’s ambition. Demi is a true believer that things shouldn’t be rushed and decided that her own journey should develop in a more natural and personal way reaching people through live shows and social media and hard work. “When I left the XFactor it was a big decision but I’ve always had dreams of coming to England due to it’s incredible music history. I passed the auditions for the Australian X Factor but decided not to enter the show in order to reach fans in a more traditional way. It was a difficult decision to leave the show with the chance of reaching so many people but I’m excited about getting out there, meeting lots of people and trying to grow my fanbase through live gigs” (Demi). ‘RUINS’ was the song that made her our ‘Artist Of The Month‘ last year. Check out our review for more. Also her stunning song ‘Rivers Run To Red‘ won best Pop/Dance Song of 2014 ‘Australian Songwriters Association’ it was also covered by the ‘The Voice’ winner ‘Charley Ann‘. Now in London Demi feels this is the biggest show of her career so far. Also meeting a top producer with 60 million record sales under his belt to work on her album, the future looks bright..
Demi’s unique brand of folk inspired pop has built up an impressive following worldwide through live shows and social media, constantly receiving positive media reviews. Having completed her degree, released her EP and hit single, travelling the world, passing the X factor auditions and supporting ‘Gabrielle Alpin’ at her sold out show in Nottingham, it seems she’s made the right choices. This entry was posted in Reviews and tagged BREAST CANCER, COPPAFEEL, Demi Louise, RIVERS RUN TO RED, Ruins. Bookmark the permalink.